There is nothing in England that exercises a more delightful spell over my imagination than the lingerings of the holiday customs and rural games of former times. They recall the pictures my fancy used to draw in the May morning of life, when as yet I only knew the world through books, and believed it to be all that poets had painted it; and they bring with them the flavour of those honest days of yore, in which, perhaps with equal fallacy, I am apt to think the world was more home-bred, social, and joyous than at present. I regret to say that they are daily growing more and more faint, being gradually worn away by time, but still more obliterated by modern fashion. They resemble those picturesque morsels of Gothic architecture which we see crumbling in various parts of the country, partly dilapidated by the waste of ages, and partly lost in the additions and alterations of latter days. Poetry, however, clings with cherishing fondness about the rural game and holiday revel, from which it has derived so many of its themes,--as the ivy winds its rich foliage about the Gothic arch and mouldering tower, gratefully repaying their support by clasping together their tottering remains, and, as it were, embalming them in verdure. Of all the old festivals, however, that of Christmas awakens the strongest and most heartfelt associations. There is a tone of solemn and sacred feeling that blends with our conviviality, and lifts the spirit to a state of hallowed and elevated enjoyment. The services of the church about this season are extremely tender and inspiring. They dwell on the beautiful story of the origin of our faith, and the pastoral scenes that accompanied its announcement. They gradually increase in fervour and pathos during the season of Advent, until they break forth in full jubilee on the morning that brought peace and good-will to men. I do not know a grander effect of music on the moral feelings than to hear the full choir and the pealing organ performing a Christmas anthem in a cathedral, and filling every part of the vast pile with triumphant harmony. It is a beautiful arrangement, also derived from days of yore, that this festival, which commemorates the announcement of the religion of peace and love, has been made the season for gathering together of family connections, and drawing closer again those bands of kindred hearts which the cares and pleasures and sorrows of the world are continually operating to cast loose; of calling back the children of a family who have launched forth in life, and wandered widely asunder, once more to assemble about the paternal hearth, that rallying-place of the affections, there to grow young and loving again among the endearing mementoes of childhood. There is something in the very season of the year that gives a charm to the festivity of Christmas. At other times we derive a great portion of our pleasures from the mere beauties of nature. Our feelings sally forth and dissipate themselves over the sunny landscape, and we "live abroad and everywhere." The song of the bird, the murmur of the stream, the breathing fragrance of spring, the soft voluptuousness of summer, the golden pomp of autumn; earth with its mantle of refreshing green, and heaven with its deep delicious blue and its cloudy magnificence, all fill us with mute but exquisite delight, and we revel in the luxury of mere sensation. But in the depth of winter, when nature lies despoiled of every charm, and wrapped in her shroud of sheeted snow, we turn for our gratifications to moral sources. The dreariness and desolation of the landscape, the short gloomy days and darksome nights, while they circumscribe our wanderings, shut in our feelings also from rambling abroad, and make us more keenly disposed for the pleasures of the social circle. Our thoughts are more concentrated; our friendly sympathies more aroused. we feel more sensibly the charm of each other's society, and are brought more closely together by dependence on each other for enjoyment. Heart calleth unto heart; and we draw our pleasures from the deep wells of living kindness, which lie in the quiet recesses of our bosoms: and which when resorted to, furnish forth the pure element of domestic felicity. The pitchy gloom without makes the heart dilate on entering the room filled with the glow and warmth of the evening fire. The ruddy blaze diffuses an artificial summer and sunshine through the room, and lights up each countenance into a kindlier welcome. Where does the honest face of hospitality expand into a broader and more cordial smile--where is the shy glance of love more sweetly eloquent--than by the winter fireside? and as the hollow blast of wintry wind rushes through the hall, claps the distant door, whistles about the casement, and rumbles down the chimney, what can be more grateful than that feeling of sober and sheltered security with which we look around upon the comfortable chamber and the scene of domestic hilarity? 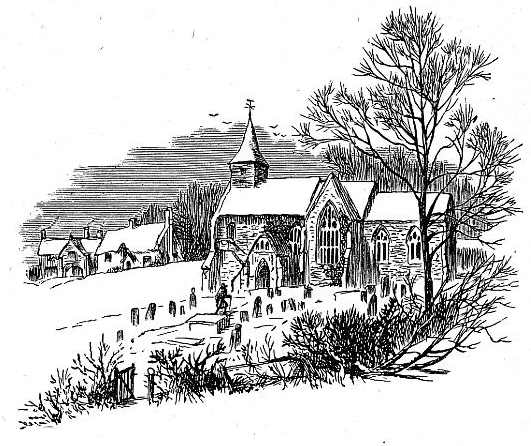 The English, from the great prevalence of rural habits throughout every class of society, have always been fond of those festivals and holidays which agreeably interrupt the stillness of country life; and they were, in former days, particularly observant of the religious and social rites of Christmas. It is inspiring to read even the dry details which some antiquarians have given of the quaint humours, the burlesque pageants, the complete abandonment to mirth and good-fellowship with which this festival was celebrated. It seemed to throw open every door, and unlock every heart. It brought the peasant and the peer together, and blended all ranks in one warm generous flow of joy and kindness. The old halls of castles and manor-houses resounded with the harp and the Christmas carol, and their ample boards groaned under the weight of hospitality. Even the poorest cottage welcomed the festive season with green decorations of bay and holly--the cheerful fire glanced its rays through the lattice, inviting the passenger to raise the latch, and join the gossip knot huddled around the hearth, beguiling the long evening with legendary jokes and oft-told Christmas tales. One of the least pleasing effects of modern refinement is the havoc it has made among the hearty old holiday customs. It has completely taken off the sharp touchings and spirited reliefs of these embellishments of life, and has worn down society into a more smooth and polished, but certainly a less characteristic surface. Many of the games and ceremonials of Christmas have entirely disappeared, and like the sherris sack of old Falstaff, are become matters of speculation and dispute among commentators. They flourished in times full of spirit and lustihood, when men enjoyed life roughly, but heartily and vigorously; times wild and picturesque, which have furnished poetry with its richest materials, and the drama with its most attractive variety of characters and manners. The world has become more worldly. There is more of dissipation, and less of enjoyment. Pleasure has expanded into a broader, but a shallower stream, and has forsaken many of those deep and quiet channels where it flowed sweetly through the calm bosom of domestic life. Society has acquired a more enlightened and elegant tone; but it has lost many of its strong local peculiarities, its homebred feelings, its honest fireside delights. The traditionary customs of golden-hearted antiquity, its feudal hospitalities, and lordly wassailings, have passed away with the baronial castles and stately manor-houses in which they were celebrated. They comported with the shadowy hall, the great oaken gallery, and the tapestried parlour, but are unfitted to the light showy saloons and gay drawing-rooms of the modern villa. Shorn, however, as it is, of its ancient and festive honours, Christmas is still a period of delightful excitement in England. It is gratifying to see that home feeling completely aroused which seems to hold so powerful a place in every English bosom. The preparations making on every side for the social board that is again to unite friends and kindred; the presents of good cheer passing and repassing, those tokens of regard, and quickeners of kind feelings; the evergreens distributed about houses and churches, emblems of peace and gladness; all these have the most pleasing effect in producing fond associations, and kindling benevolent sympathies. Even the sound of the waits, rude as may be their minstrelsy, breaks upon the mid-watches of a winter night with the effect of perfect harmony. As I have been awakened by them in that still and solemn hour, "when deep sleep falleth upon man," I have listened with a hushed delight, and, connecting them with the sacred and joyous occasion, have almost fancied them into another celestial choir, announcing peace and good-will to mankind. Amidst the general call to happiness, the bustle of the spirits, and stir of the affections, which prevail at this period, what bosom can remain insensible? It is, indeed, the season of regenerated feeling--the season for kindling, not merely the fire of hospitality in the hall, but the genial flame of charity in the heart. The scene of early love again rises green to memory beyond the sterile waste of years; and the idea of home, fraught with the fragrance of home-dwelling joys, reanimates the drooping spirit,-- as the Arabian breeze will sometimes waft the freshness of the distant fields to the weary pilgrim of the desert. Stranger and sojourner as I am in the land,--though for me no social hearth may blaze, no hospitable roof throw open its doors, nor the warm grasp of friendship welcome me at the threshold,--yet I feel the influence of the season beaming into my soul from the happy looks of those around me. Surely happiness is reflective, like the light of heaven; and every countenance, bright with smiles, and glowing with innocent enjoyment, is a mirror transmitting to others the rays of a supreme and ever shining benevolence. He who can turn churlishly away from contemplating the felicity of his fellow beings, and sit down darkling and repining in his loneliness when all around is joyful, may have his moments of strong excitement and selfish gratification, but he wants the genial and social sympathies which constitute the charm of a merry Christmas.